One of the main thrusts of Monday's Budget 2015 announcement was SkillsFuture, a scheme to deepen and broaden people's skills so that they can remain relevant in a changing economy. Singaporeans in the early and middle parts of their careers who are keen to deepen their skills in growth sectors such as financial services and health care can apply for study awards of up to $5,000 to offset fees for courses approved by public sector agencies. These may include overseas courses in certain sectors. Those who are more senior and have helped to train others can apply for fellowship support of $10,000 to master skills in their fields. Both these monetary awards are bond-free, the secretariat said. Workers will also be able to tap on new funding sources to take up courses to develop their work skills. More than two million Singaporeans aged 25 and above next year will receive $500 in SkillsFuture Credit, which will be topped up in the future. Fresh polytechnic and Institute of Technical Education graduates will be able to apply for a 12- to 18-month programme at companies that will provide on-the-job training and sponsor further studies towards an industry-recognised certification. Up to one in three graduates will be able to join the programme by 2025, which links them with employers selected by the Government for offering good training and career progression plans. Employers can get a grant of up to $15,000 for each trainee they hire, while employees will get a sign-on bonus of $5,000, given in two tranches. There may be a bond for certain sectors for which training requires a larger investment from companies. The scheme will be launched next month in four sectors: logistics, food manufacturing, retail and food-and-beverage. 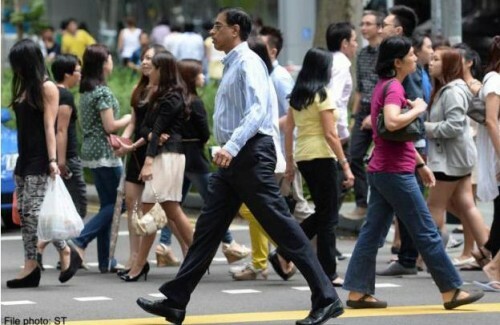 Training subsidies for Singaporeans aged 40 and up will be raised this year, to at least 90 per cent for diploma to postgraduate courses funded by the Ministry of Education (MOE), and up to 90 per cent for courses supported by the Singapore Workforce Development Agency. SkillsFuture Credit can be used to offset the remaining fees. Workers will also get to choose from a wider range of short course options - from diploma to undergraduate level - introduced by MOE. They will be able to apply for standalone modules for particular skills, or those which can be stacked up to attain a certification. A diploma level module could be completed in 30 to 60 hours, compared with around 900 hours in total for a part-time diploma. The first group of new modular courses will be for skills relevant to the key priority and growth sectors identified by the Government, such as advanced manufacturing, social services and early childhood education. More sectors will be added over time. Workers may also get more leadership training opportunities as the Government will support companies which create or enhance in-house talent development programmes.